A perfect gift set for any woman from a young girl to a lady, made of Freshwater cultured pearls at a jewelry price. 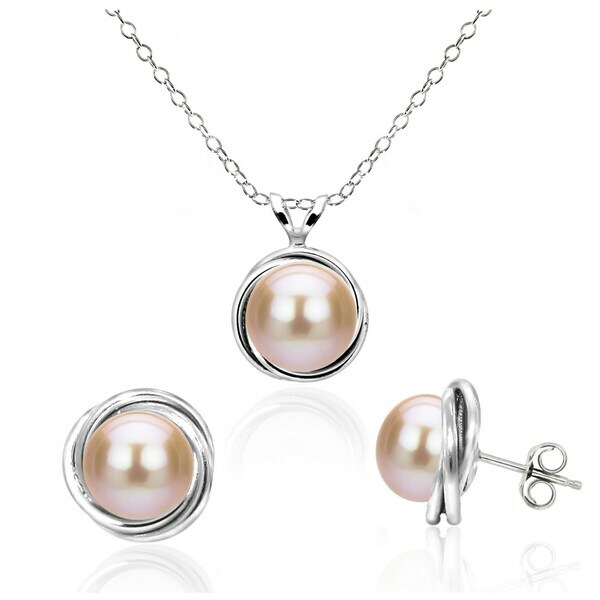 Be on top of the hottest new trend with this Pink Freshwater pearl pendant and earrings set. This beautiful Bazel Design Pendant is made of 8-8.5mm Pink Freshwater cultured pearl hanging off a beautifully crafted 18" .925 Sterling Silver Cable chains. Completing the set is a pair of matching Bazel Design earrings of 7-7.5mm Pink Freshwater Pearl Stud earrings. This pendant and earrings set will greatly complement both your dress and outerwear. Dimensions 2.0 In. X 2.0 In. X 2.0 In. DaVonna Sterling Silver Pink Freshwater Graduated Pearl and Beads Pendant Necklace, 18"